Josua Mata, Secretary-General of SENTRO, stated that six months into the presidency of Rodrigo Roa Duterte, the Philippines is now in a seething state of tension, division and political polarization. “For all his bluster, bravado and posturing in promising change since the May 2016 elections, he has only succeeded in worsening the social, economic and political gap between the privileged and the excluded in Philippine society,” added Mata. The “war on drugs” Duterte has sanctioned continues to prove itself as a “war on the poor”—with 5,617 casualties. With a police hierarchy under PNP Chief Ronaldo “Bato” dela Rosa wholly subservient to the whims of the President, our police institutions, constitutionally-mandated to protect and serve the public from crime and violence, now glories in its role as the President’s praetorian guard of butchers and hatchet-men. 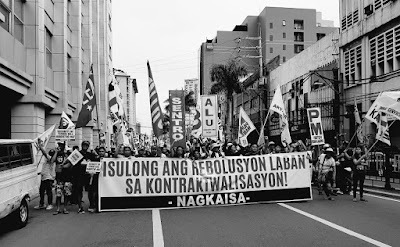 Mata stated that “the Duterte regime, proving its promise of standing up against the elites of Philippine society as full of hot air, has also visibly backtracked on its promise to dismantle the ‘endo’ system of contractualization in favor of the working peoples (both in the manufacturing and service sectors).” That the Labor Secretary, Silvestre Bello III, continues to vacillate between the just demands of the working peoples’ movements and the rapacious threats of the employers and capitalists, poses massive questions to whether this issue will actually be resolved in the name of social justice, the statement continued. “The Filipino people are already waking up to the monumental costs of their choice in the polls,” according to SENTRO. “That mobilizations and indignation protests continue to be mounted by the millennial generation of today against the burial of the tyrant Marcos show that the administration is beginning to wear its welcome.” It says that even the President’s supporters are now beginning to be split in their condoning of the “war on drugs” suggests that this platform is unravelling without a clear end-goal in mind. “That a growing number of our population are now finding the perorations and propagandizing of the Duterte camp’s online “trolls” and unofficial spokespersons (all of dubious character and non-existent integrity) is a heartening sign that reason and basic decency have not yet left Philippine public discourse,” added Mata. Finally, SENTRO called on the Filipino people to remain vigilant and insistent on their social, economic and political rights.